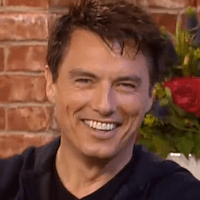 Actor John Barrowman, who older readers may remember played Captain Jack Harkness in Doctor Who and Torchwood, was interviewed on the ITV1 “show” This Morning earlier today – watch a clip in the player below. In it he talks about his new series Arrow and being involved in the Doctor Who 50th Anniversary though it’s worth noting that he quickly stated on Twitter that he didn’t state which capacity he’d be involved in. I REALLY want Jack to be back in the anniversary episode. love the character. way better the River Song who is SO just a female Captain Jack.